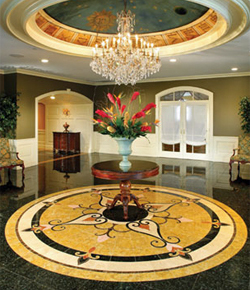 Oshkosh Designs creates customized, innovative designs for your floor inlay and other decorative projects. In 1992, company founders Tom Peotter and Lee Bettes started their business in Bettes’ basement in Oshkosh, WI. Tom and Lee never anticipated the surprises and success they would find as their business grew. The team, known as Historic Floors of Oshkosh, started out specializing in historic home restoration, but quickly learned those constructing new homes were interested in their products as well. Due to the ever-increasing demand, the company soon outgrew the basement and found a new home in Winneconne, WI. Along with the move came a new company identity- Oshkosh Floor Designs. The company continued to grow as Tom and Lee sought out local master craftsman to increase the production team. These artisan craftsmen not only brought their physical skills, but their solid work ethics and values that has made the company what it is today. The new location also allowed for advancements in production and technology. The company was able to implement laser technology - allowing it to specialize in intricate cutting. Later, Oshkosh Floor Designs started using water jet technology to implement stone, recycled glass and non-ferrous metals into their classic designs. In response to market demands, Oshkosh Floor Designs began promoting their product as more than just floor inlay. With endless application possibilities, the company began seeing their product used in stair risers, treads, chair rails, ceilings, backsplashes and more. Today, Oshkosh Floor Designs is known simply as Oshkosh Designs. The company’s expertise in specialized inlay continues to draw in unique projects- resulting in customized satisfaction.